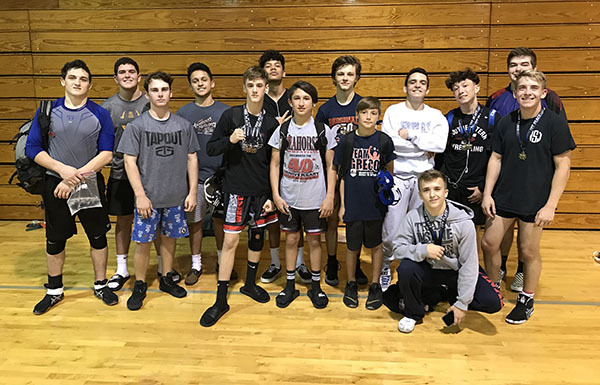 The Wellington Wrestling Club attended the Mustang Open at Merritt Island High School on Saturday, April 6 and had an outstanding day with a number of wrestlers earning top honors. Champions were Tyler Gray, Sam Marvel, James Marvel, Sean Mauermann and Nico Strada. Luke Forehand and Aiden Alexander took second place, while Luke Schumatti and Ryan King took third place. Shown above (L-R) are Tenzin Tognini, Aiden Alexander, Seth Rhodes, Jared Portu, Ryan King, Juan Quintero, Sam Marvel, Luke Schumatti, Tyler Gray, Luke Forehand, Sean Mauermann, James Marvel, Preston Morrow and Nico Strada.